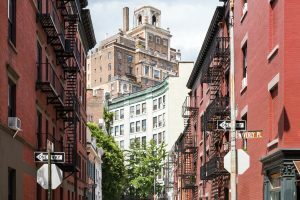 The New York City Council is proposing a local law that would restrict the Department of Buildings (DOB) from approving any alteration or demolition applications for buildings that are calendared by the Landmarks Preservation Commission (LPC). The bill is designed to create a better understanding of both DOB and LPC policy and procedure. If passed, the law will go into effect 90 days after enactment. The local law would introduce a new requirement that LPC provides the DOB with written notice that a property has been calendared. The first formal step in the landmark designation process, calendaring refers to passing a motion to schedule a public hearing on a property being considered for designation as a landmark site, interior landmark or as part of a historic district. LPC must notify DOB within two business days of adopting such a motion. The proposed bill would also prevent professional certification of construction documents for properties that have been calendared by LPC. Those documents would require a full DOB examination. Of course, turnabout is fair play. Upon receiving a permit application for construction, reconstruction, alteration or demolition of an improvement on a property that has been calendared by LPC, the DOB commissioner would have two business days to forward a copy of the application to the LPC chair. Upon meeting one of the above requirements, the commissioner could then approve the documents. If approved, DOB would have to provide applicants with prompt written notice, no later than 10 calendar days after the expiration of such a 40-day period. We will update you on the status of this local law as it proceeds through city government. In the meantime, to discuss the potential impact on your upcoming projects, contact Metropolis Group at 212.233.6344.